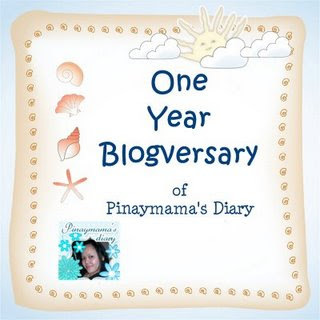 PINAY MAMA'S DIARY is hosting a Blogoversary contest as she celebrate her success for one year! Let's toast to that! 1. Blog about the contest, don't forget to grab the badge and direct link to http://gardenofmoments.com. A few sentence will do. At the bottom of your post, don't forget to link all of her blogs, as well as her sponsor's blogs and their individual links. 2. Subscribe to Pinaymama's Diary feed via email. 3. Fave http://gardenofmoments.com in Technorati. 4. Leave your link in the comment section. 6. All entries must be submitted before or on October 31st, 12 am (EST). I will announce the winner in November 1, 2008 EST. Note: If you live outside the US, since I can't ship internationally, a $10.00 will be deposited directly in to your Paypal account. That's it! So what are you waiting for? Join the fun who knows you will be one of the Lucky Winners!